Chose this cruise because of the opportunity to see New Zealand and Australia. For us, this was the chance of a lifetime and we were looking forward to checking this off our bucket list! We flew in the night before to Auckland and spent the next day touring the city for a bit before boarding our cruise! Embarkation was a breeze. Everyone there was very friendly. We headed to our cabin and were shocked to find stains on our sheets and bedskirt and a balcony that you wouldn&apos;t want to step foot on unless you had your shoes on (pictures posted). So we turned around and headed straight to Guest Services with our pictures to ask to be switched to a different room. Mind you, I have never ever made such a request. 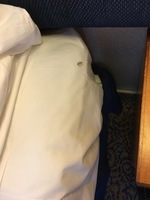 But this was NOT Royal Caribbean quality - this was Motel 6 in a bad part of town quality going on here! Of course, they said they didn&apos;t have any other rooms, but they would send housekeeping and maintenance to come take a look. When they arrived, they changed the sheets and bedskirt and told us that they knew the balcony was bad and not up to their standards. They told us they could fix it, but it would take three days and we wouldn&apos;t be able to use it. In the meantime, they powerwashed it, (but that didn&apos;t change anything) and provided beach towels to put on the balcony floor!!! So needless to say that part was a real disappointment because I&apos;ve been on several RC cruises and Royal Caribbean is better than this. The second day of the cruise I realize that our in-room refrigerator isn&apos;t cooling anything. When I ask our room steward about this, he tells me it isn&apos;t a refrigerator, it&apos;s a cooler. I explain that I have a prescription that needs to be refrigerated and he says he will talk to his supervisor about it. We go out that day on our excursions and when I return I find a 3 1/5 foot refrigerator in the middle of the floor of our room!!!!!! WTH!! I moved it out to the hallway and called maintenance to come pick it up! From then on they provided me with ice buckets each night and plastic bags for me to put my prescription in it to keep it cold. SMH As far as other public facilities, the wear and tear on this boat is showing. One night I went to the ladies room and (I kid you not) the faucet was being held together by duct tape!!! There were three sinks with three soap dispensers and only one dispenser worked. The attendant acknowledged that the other two were broken, and says "here you can use this one." (I was stunned and disappointed - I&apos;ve never seen anything like that on a Royal Caribbean cruise.) The dining was great as usual. We ate at the Windjammer for breakfast and the MDR for dinner each evening. I don&apos;t know why people complain about the food. Honestly, there&apos;s so much selection that if you don&apos;t like something, try something else! Entertainment and activities were limited because it&apos;s a smaller ship. The Cruise Director was entertaining & made an effort to mingle with the guests and say hi. The ports were great! There&apos;s so much to see and do in NZ! Honestly I want to go back to NZ to see more. Though I would advise not doing the Akaroa - Christchurch and Countryside tour. We went to a sheep ranch and watched the farmer shear sheep and then watched his dogs herd sheep from the mountain. Afterwards his wife had sausage rolls, tea, and biscuits for everyone. THAT part was awesome! They were a lovely couple who were just so kind and welcoming to allow our tour group to come to their home. The rest of the tour was a loooong drive to Christchurch which was a pretty countryside drive. However, the drive was over an hour and a half just to get to Christchurch! Then we were only there about 50 minutes before we had to get back on the bus to head back to the ship for an almost two hour drive. And honestly, there isn&apos;t much of anything to see in Christchurch. You see the cathedral which is still in terrible disrepair from the earthquake in 2011 and still has fencing all around it. That&apos;s it! That&apos;s all there is to see! You get off the bus, walk up to where the cathedral is, & look at it. Then you try and find a bite to eat and get back on the bus. So the majority of this excursion was spent on a bus!!! Not my idea of a good time. Total waste of time spent there in my opinion. Save your money on this excursion and find something else to do. Fitness center was good. My husband went there most everyday and I ran on the outdoor track each morning, before the crowds head up there. Overall this was a wonderful cruise and I would love to go again! But we will never cruise on this ship again or this size ship again. We definitely prefer the larger, newer ships. 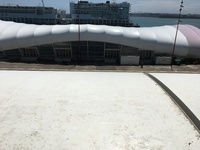 The view from our balcony of the overhang that covers the lifeboats below. Chose this cruise because of the opportunity to see New Zealand and Australia. For us, this was the chance of a lifetime and we were looking forward to checking this off our bucket list! We flew in the night before to Auckland and spent the next day touring the city for a bit before boarding our cruise! Embarkation was a breeze. Everyone there was very friendly. We headed to our cabin and were shocked to find stains on our sheets and bedskirt and a balcony that you wouldn&apos;t want to step foot on unless you had your shoes on (pictures posted). So we turned around and headed straight to Guest Services with our pictures to ask to be switched to a different room. Mind you, I have never ever made such a request. But this was NOT Royal Caribbean quality - this was Motel 6 in a bad part of town quality going on here! Of course, they said they didn&apos;t have any other rooms, but they would send housekeeping and maintenance to come take a look. 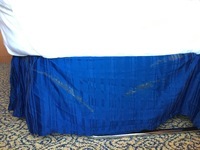 When they arrived, they changed the sheets and bedskirt and told us that they knew the balcony was bad and not up to their standards. They told us they could fix it, but it would take three days and we wouldn&apos;t be able to use it. 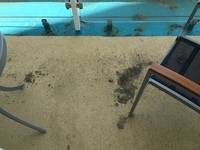 In the meantime, they powerwashed it, (but that didn&apos;t change anything) and provided beach towels to put on the balcony floor!!! So needless to say that part was a real disappointment because I&apos;ve been on several RC cruises and Royal Caribbean is better than this. The second day of the cruise I realize that our in-room refrigerator isn&apos;t cooling anything. When I ask our room steward about this, he tells me it isn&apos;t a refrigerator, it&apos;s a cooler. I explain that I have a prescription that needs to be refrigerated and he says he will talk to his supervisor about it. We go out that day on our excursions and when I return I find a 3 1/5 foot refrigerator in the middle of the floor of our room!!!!!! The dining was great as usual. We ate at the Windjammer for breakfast and the MDR for dinner each evening. I don&apos;t know why people complain about the food. Honestly, there&apos;s so much selection that if you don&apos;t like something, try something else! Entertainment and activities were limited because it&apos;s a smaller ship. The Cruise Director was entertaining & made an effort to mingle with the guests and say hi. The ports were great! There&apos;s so much to see and do in NZ! Honestly I want to go back to NZ to see more. Though I would advise not doing the Akaroa - Christchurch and Countryside tour. We went to a sheep ranch and watched the farmer shear sheep and then watched his dogs herd sheep from the mountain. Afterwards his wife had sausage rolls, tea, and biscuits for everyone. THAT part was awesome! They were a lovely couple who were just so kind and welcoming to allow our tour group to come to their home. The rest of the tour was a loooong drive to Christchurch which was a pretty countryside drive. However, the drive was over an hour and a half just to get to Christchurch! Then we were only there about 50 minutes before we had to get back on the bus to head back to the ship for an almost two hour drive. And honestly, there isn&apos;t much of anything to see in Christchurch. You see the cathedral which is still in terrible disrepair from the earthquake in 2011 and still has fencing all around it. That&apos;s it! That&apos;s all there is to see! You get off the bus, walk up to where the cathedral is, & look at it. Then you try and find a bite to eat and get back on the bus. So the majority of this excursion was spent on a bus!!! Not my idea of a good time. Total waste of time spent there in my opinion. Save your money on this excursion and find something else to do. Fitness center was good. My husband went there most everyday and I ran on the outdoor track each morning, before the crowds head up there. Overall this was a wonderful cruise and I would love to go again! But we will never cruise on this ship again or this size ship again. We definitely prefer the larger, newer ships. Nothing to see in Christchurch except lots of construction still going on since the earthquake in 2011! Save your $$$. Tour of Napier to see city and much Art Deco decor throughout the city. Much of the town was closed being it was a Sunday. Stopped at a little farm market for ice cream and fruit samples. Stopped at a chocolate factory for samples that were divine! the Whakarewarewa Thermal region and Maori village. A living village situated in a landscape of erupting geothermal activity, hot thermal springs and hot bubbling mud pools. This is the location of the famous Pohutu Geyser. We were hosted by a wonderful local Maori guide named Chief! He was fantastic!! Got to see first-hand how the geothermal activity is used in everyday life with hot springs and steam vents used for cooking (we even had a lovely meal that was prepared in the hot springs) and saw the natural mineral waters used for communal bathing. Enjoyed a traditional Maori welcome with traditional songs, dances and demonstrations of fighting skills, including the famous Haka. Drove through Rotorua City to see the formal Government Gardens, the famous Rotorua Bath House, Museum, and Rachel’s Spring. Our tour guide Jan made it possible for us to make stops for souvenir shopping and ICE CREAM!! the spectacular views. We went up to Mount Victoria Lookout for another 360-degree stunning view. We then headed out to visit Peter Jacksons Weta Cave, where you got to view the original Lord of The Rings props and memorabilia from LOTR. We also had time to make a stop at the Museum of New Zealand where we were able to see the Qin Dynasty First Emperors Terracotta Warriors on display!